The Longview Arboretum and Nature Center grew out of a dream of Gregg County Master Gardeners and 26 acres along Grace Creek, in the heart of Longview. In the course of time, the land was walked, studied, and assigned a task force by the City of Longview. From that task force, an invitation was extended to a team of experts from Stephen F. Austin and the Lady Bird Johnson Center; and from those invaluable resources, design concepts were drawn, flora and fauna evaluations determined, and a long-range plan for execution was created. In 2015, plans were reinvigorated and a new team assembled to see the master plans brought to life. Through a non-profit board and a partnership with the City of Longview, plans exist to create a public/private partnership to bring the arboretum to life as a city park. Now with growing donations, and the purchase of a building at 706 W. Cotton Street to one day become the Longview Arboretum Visitor's Center, plans for the gardens have been escalated. Due to the enthusiasm of supporters, the board of directors hosted an official ground breaking in September, 2017 complete with dignitaries, donors, and community folks gathered together for the turning of dirt, and the implementation of long held plans. 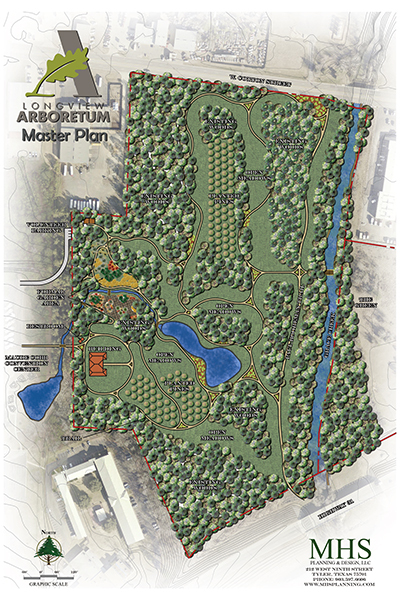 If winter and spring goals go well, construction will soon begin on Phase 1 of the Longview Arboretum master plans, with a grand opening anticipated a year's time after construction starts. What’s unique about this park? The Longview Arboretum is a master-planned, multi-use arboretum centrally located in East Texas, the only one of its kind. Beautifully situated near downtown to celebrate indigenous trees and native flora/fauna, it’s will be a place of leisure, reflection and peaceful pursuits. The Longview Arboretum shares parking with Maude Cobb Activity and Event Center, it covers 26 acres of watershed from Grace Creek and borders the JR Curtis Garden for the Blind and The Green. With the purchase of a building at 706 W. Cotton Street, the renovated space will become the exhibition and administration building for the Longview Arboretum and a dedicated entrance for the gardens. The Longview Arboretum is a public/private partnership with the City of Longview. The city will manage the park as part of its overall Parks and Recreation Department and the Friends of the Arboretum will sponsor events, membership, and oversee special developments extending the uses of the park. What makes it an Arboretum? An Arboretum is a park that celebrates trees and native plants. The Longview Arboretum will feature cultivated forests, meadows, formal and informal gardens, waterways, and extensive walking trails. A pavilion and event center will accommodate meeting spaces. Learning nodes positioned in specific areas will teach residents about individual examples of indigenous flora/fauna. After cultivating what is already on the grounds, new elements will include: 50,000 new plants, 4 acres of intentionally designed formal gardens and graduated terraces, 14 waterfalls, a recirculation pond, meadows, 5 decorative bridges, 8’ wide walking trails, park benches, storage facility, and public restrooms. It will cost $2.5 million to build the Longview Arboretum (infrastructure, terraces, plants, trails, restrooms, storage facilities, and water systems.) The Longview Arboretum Event and Nature Center is projected to be a multi-use teaching/event facility projected to cost $2 million. After construction, the City of Longview will manage the park. With initial funding and grants received, construction will begin in October, 2017, with basic infrastructure and Phase I plans completed by May, 2018. Additional work will continue as funds accrue. To date Gregg County Commissioners Court and the City of Longview Parks and Recreation department have begun initial clearing, pond creation, grass planting, and pest control. Click on the image for a downloadable document.